The Port of Troon offers one of the most sheltered harbours on the west coast of Scotland. An efficient trunk road system connects the port to the motorways of Scotland and England. 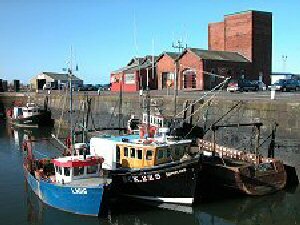 Troon is now established as a major ferry and fishing port, and is the closest fishing port to the rest of the UK. Troon is administered from Ayr. An area of good quality, hard-surfaced quay provides existing and potential customers with an ideal location for the movement of general cargoes. A major new ro-ro terminal opened in 2001 for P&O Irish Sea, which operates its twice-daily Scotland/Ireland freight service from Troon Harbour. By moving its operations to Troon, P&O Irish Sea are able to use larger vessels than were used on the route to Larne, Ireland. Troon Yacht Haven is a 300-berth marina offering attractive pricing on a wide range of modern facilities for berth-holders and visiting yachtsmen. Troon offers: a high-speed SeaCat service to Belfast, three times a day; a one-stop shop for the fishing industry, with Scotland’s first electronic fish-auction facility and a modern fish market compliant with EU regulations and excellent opportunities to develop ro-ro services.